Reverse transcription-polymerase chain reaction (RT-PCR) is a very sensitive technique to measure and to compare mRNA levels among samples. However, it is extremely difficult to maintain linearity across the entire procedure, especially at the step of PCR amplification. Specific genes have been used as baseline controls to be co-amplified with target genes to normalize the amplification efficiency, but development or selection of reliable controls itself has created a new challenge. Here, we describe a new quantitative RT-PCR to compare two mRNA samples directly without the requirement of synthetic control DNAs for reference. First, chimeric RT primers carrying gene-specific and universal PCR priming sequences with or without a linker for size distinction were utilized to generate cDNAs. The size-different cDNAs were then combined in a single reaction for PCR amplification using the same primer set. The two amplified products were resolved and detected with gel electrophoresis and fluorescence imaging. Relative abundance of the two products was obtained after a baseline correction. This methodology is simple and accurate as indicated by equal amplification efficiency throughout PCR cycling. It is also easily implemented for many existing protocols. In addition, parameters affecting RT linearity are characterized in this report. 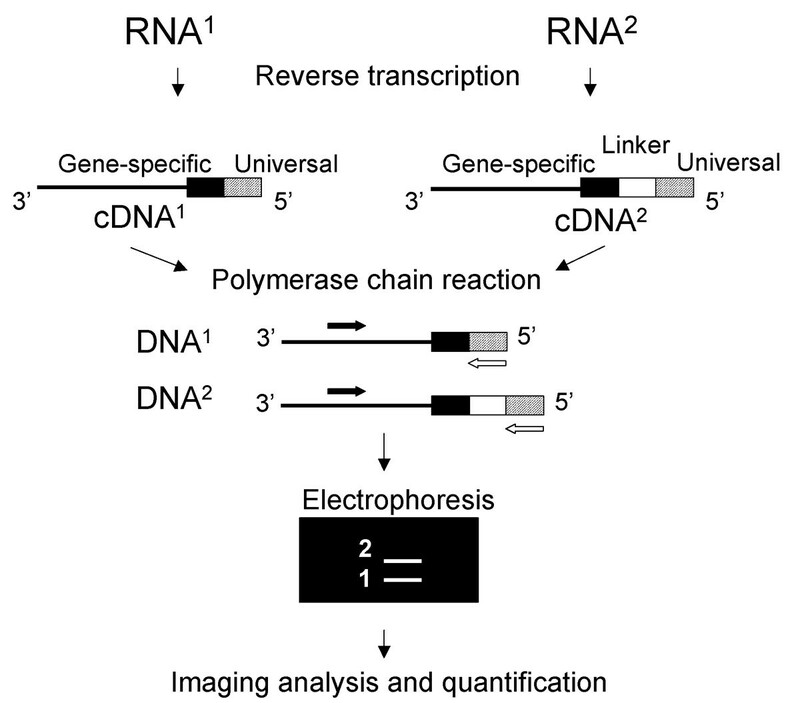 Many techniques have been developed to quantify mRNA levels . Among them, reverse transcription-polymerase chain reaction (RT-PCR), amplifying nucleic acid molecules, is the most sensitive method [2–4]. The amount of starting mRNA is not only significantly conserved, but also genes with low expression level are detectable after amplification. Since the RT-PCR consists of cDNA synthesis, DNA amplification, and signal detection as sequential steps, the accuracy of quantification is dependent on the efficiency across these steps, especially the RT and the cDNA amplification. The difference in product yield due to varied RT and PCR efficiencies, even though small in the beginning, can be amplified dramatically to confuse the final quantification (Fig. 1). Several approaches have been pursued to overcome this technical limitation. 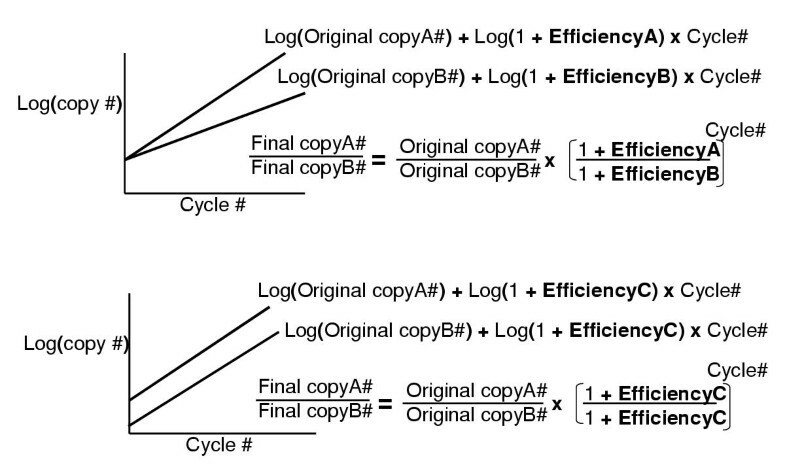 Mathematical model of PCR efficiency plot and estimation of original copy number after amplification. Accurate estimation can be obtained only when the PCR efficiency is known or is equal between two reactions. Top panel: two PCR reactions with the same original copy number but different amplification efficiency (A versus B). Bottom panel: two PCR reactions with different original copy number but the same amplification efficiency C.
The relative RT-PCR procedure first establishes a number of amplification cycles, which is within linear range, and then compares samples from separate reactions to procure the ratios . This procedure does not account for the variation among reactions in different PCR environments, such as specific contents of each tube and difference between wells of the thermal cycler. Although linearity is obtained, the slopes of lines, indicative of efficiency, may not be equivalent, as seen in Figure 1. Another approach is to co-amplify control DNAs with target genes in a procedure termed competitive RT-PCR [3, 4]. The diverse efficiencies among PCRs are normalized with a signal of the same control DNA co-amplified with every test sample. In order to assure that control DNA gives the same PCR efficiency as the target gene, the control needs to be constructed empirically to minimize variation during co-amplification. To accomplish this, a specific control is developed for each target gene. Because synthetic control(s) are often much more abundant than the target, PCRs of serial dilution of control(s) are carried out to determine accurately the relative quantity of target to control(s). These steps complicate the entire procedure and make the competitive RT-PCR cumbersome. Real-time RT-PCR, an automatic version of relative RT-PCR, provides an advantage in that it monitors product yield during amplification cycling [4–6]. The CT value, the minimum number of cycles beyond which the signal exceeds a predetermined threshold, is commonly used for quantification, with the assumption of approximately 100% or equal efficiency for all PCR in the early phases of amplification. Special algorithms are then applied to obtain the relative quantity. However, the legitimacy of such assumptions and mathematical models has been challenged by others [7, 8]. Although real-time PCR provides high-throughput quantification, it is still not accessible to everyone due to the high cost for the equipment, and it is not cost-effective for projects examining only a few sample pairs. A new simple quantitative RT-PCR capable of retaining the same amplification efficiency between two test samples throughout the reaction is described here (Fig. 2). First, size-different cDNAs were generated for later product differentiation. The two cDNAs were then combined in a single amplification reaction with identical PCR parameters. The efficiency of the RT reaction was also examined with this new technique. During the course of this technical development, we noticed that a commercial kit has a similar but not identical design, called comparative RT-PCR . In this study, we also compared the kit with our methodology. Diagram of the new quantitative RT-PCR method. The PCR efficiency of different products derived from VHL gene sequences was tested first. The cDNAs, generated by corresponding long and short RT chimeric primers from equal amounts of total RNA, were combined at 1:1 volume ratio for 25 to 40 cycles of PCR. A consistent relative intensity of long to short VHL products was obtained throughout PCR cycling (Fig. 3A). This equal PCR efficiency for the short and long products was also demonstrated by apparent parallel curves in a log scale plot even though they were not straight lines (Fig. 3B). Since different primers were used in the RT step, deviation of the observed values from the expected 1:1 ratio was anticipated and was dissimilar between two PCR series with distinct linker sequence, (G)10 versus (C)10 (Fig. 3A). Permutation of RT parameters, including annealing temperature, the addition of RNase H, dilution of RNA, the use of mRNA, and cDNA purification by size-selecting column, reduces the variability only to a small extent. A similar picture was seen using other VHL and Collagen I chimeric primers (data not shown), but the deviation of the observed ratio from the expected value was higher for products with a 15-bp difference in length than with 10 bp. Observed PCR product ratios (A) and PCR efficiency plots (B) of 1:1 VHL long to short cDNA. The long (with 10-base G or C linker) and short (VHL-S) cDNAs were synthesized by Thermoscript reverse transcriptase. Weak bands of much higher than the correct 123 bp and 113 bp products were single-stranded populations of these two amplicons. Because the observed PCR product ratio for equal volumes of short and long cDNAs, from the same amount of total RNA, was not equal to 1, serial cDNA ratios were examined to determine if accurate estimation could be obtained by a baseline correction. To test if the variation was contributed by the RT reactions, long and short cDNAs were pipetted from the same RT reactions to prepare 1:1, 5:1, and 10:1 volume ratios, in which either the short or the long cDNA is not only a test sample but also a PCR control. This PCR control functions just like an external control or competitor in the competitive RT-PCR. After PCR, the observed ratios were corrected with values from either 1:1 or 5:1 long to short volume ratios from corresponding PCR cycles. An example of this experiment, carried out for sequences from the Collagen I gene, was illustrated in Figure 4. As seen in Figure 3A above, a close calculated ratio of long to short product was observed throughout PCR cycling for each cDNA ratio series (Fig. 4A). The intensity of 25-cycle products was near the background, which cannot provide accurate quantification, and therefore the ratio was not calculated. The log plot also showed a similar PCR efficiency, as evidenced by parallel curves, across the amplification cycle within each series (Fig. 4B). Among series, different efficiency was noted, especially for early PCR cycles of the 5:1 samples. When the observed value for 1:1 cDNA ratio was used as the denominator, the corrected values for 5:1 cDNA were about 4.0 from triplicate assays and they were consistent across PCR cycles (p = 0.79, statistical test for difference). The same consistency was also observed for corrected ratios for 10:1 cDNA relative to 5:1 cDNA (p = 0.61) and the values were about 2.0 from three repeated analyses. This serial experiment showed that baseline normalization was very important to correct the inherent RT variation from use of different primers and two separate reactions for short and long cDNA production. Observed and baseline-corrected PCR product ratios (A) and efficiency plots (B). The 1:1, 5:1, and 10:1 volume ratios of long (L) to short (S) Collagen I cDNA synthesized by the Thermoscript reverse transcriptase were examined to determine the accuracy of corrected ratios (with value from either 1:1 or 5:1 ratio of corresponding PCR cycle as the denominator) to expected values. To investigate linearity of the current quantitative RT-PCR procedure, cDNAs of the collagen I and the VHL genes were generated from incremental quantities of total RNA of the same cell line (0.2 μg, 1 μg, and 2 μg). Equal volumes of these long and short cDNAs were combined to become 1:1, 5:1, and 10:1 ratios, and were amplified by 25–40 cycles of PCR. At an early stage of this new technique development, the observed values were never close to predicted ratios of the RNA samples even after baseline correction using an AMV (Thermoscript) enzyme in the RT step. In the "Accurate ratio estimation" experiment above, the direct quantitative PCR itself gave values very close to expected ratios. The inability to attain the predicted RNA ratios is most likely due to non-linear relationship between RNA input and cDNA yield. Therefore, several reverse transcriptases, including Thermoscript, Superscript, Retroscript, and Omniscript, were examined to determine the efficiency of RT reactions. Initial analyses following manufacturers' protocols demonstrated that the new RT-PCR using the Omniscript yielded ratios that are closest to those predicted (data not shown). 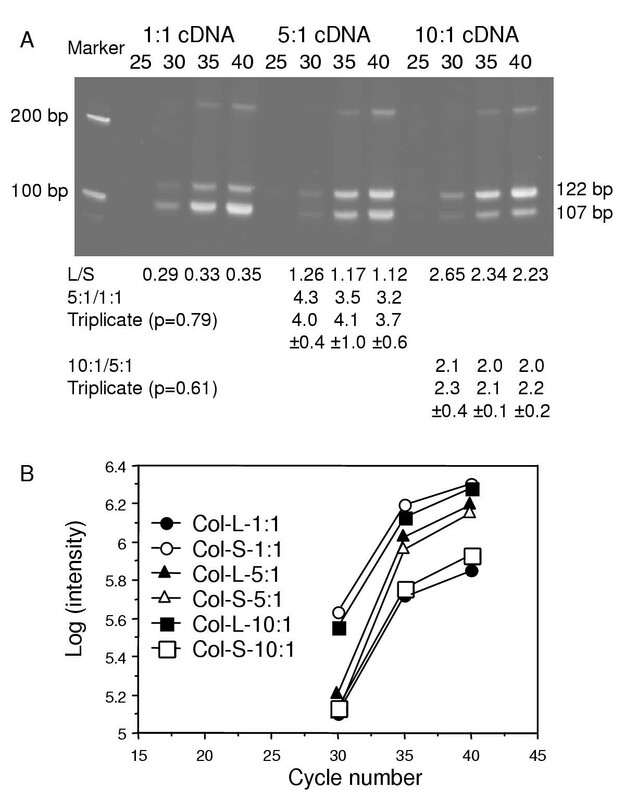 The linearity of quantification for known RNA ratios is illustrated in the top panel of Figure 5A, in which the corrected ratios for 5:1 and 10:1 RNA for the Collagen I were statistically no different from the values observed for 5:1 and 10:1 cDNA in Figure 4A at 35 cycles (p = 0.64 and p = 0.35, respectively) and 40 cycles (p = 0.10 and p = 0.44, respectively). Notably, the 1:1 RNA for the Collagen I long products from less than 30-cycle PCR had fluorescence intensity close to background and the difference in the yield of long versus short products was very marked throughout (Fig. 5B). These were proven to be the key factors resulting in variation in ratio estimation, and therefore 2:1 or 5:1 samples were chosen for use in baseline corrections in the analyses of cell lines. 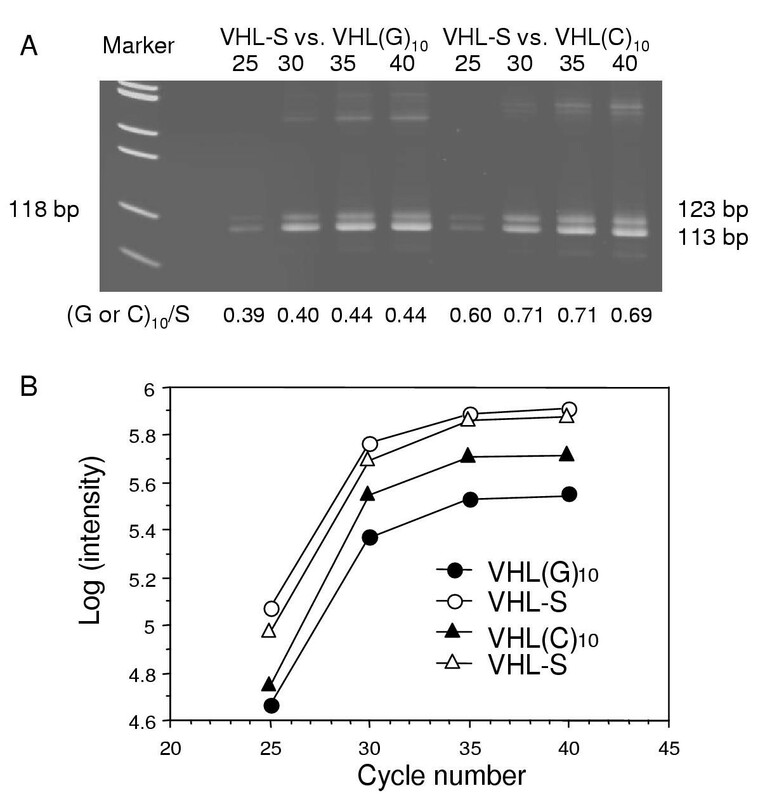 When additional genes, VHL (Fig. 5A, lower panel) and Tem8 (data not shown), were examined, the average corrected ratios were close to the expected values for 5:1 RNA but not for 10:1 RNA, suggesting variability of RT efficiency among target genes and needs for further RT improvement. 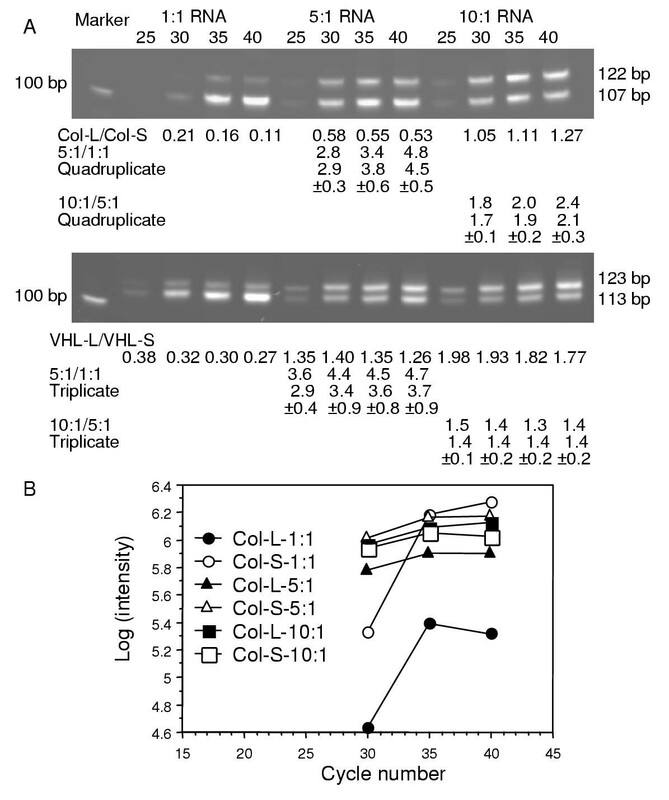 Observed and baseline-corrected ratios of long (L) to short (S) Collagen I and VHL PCR products. The cDNAs were synthesized by Omniscript reverse transcriptase from incremental quantities of total RNA (A). The observed ratios were corrected by values from either 1:1 or 5:1 RNA ratio of the corresponding PCR cycle. PCR efficiency plot is illustrated for Collagen I only (B). Since the IntraSpec Comparative RT-PCR kit with a similar but not identical design became commercially available while we were developing the current technique, the feasibility of the kit for quantification of the VHL and Collagen I RNAs was also determined simultaneously. Analysis of the rat VHL RNA was excluded because a poly-A tail could not be found in any rat VHL sequences deposited in the GenBank. The amplification of Collagen I is shown in Figure 6. Multiple bands, similar to an artifact when amplifying repetitive sequences , were observed, in addition to two products with the correct length. Only products of 35- and 40-cycle PCR were unambiguously measured by the imaging system. The corrected ratios for 10:1 RNA were 1.0 and 1.4, apparently different from the expected value, 10, suggesting that this method is unsuitable for quantification. Observed and baseline-corrected ratios of long to short Collagen I PCR products. The cDNAs were synthesized by an IntraSpec kit from incremental quantities of total RNA. The proper product sizes were 222 bp and 182 bp. The new direct quantitative RT-PCR was next applied to compare cell lines, which had been shown to be significantly different with regard to Collagen I RNA level by cDNA microarray analysis (Mouse GEM I, IncyteGenomics, St. Louis, MO). Twice the amount of the long cDNA as the short cDNA was intentionally applied to increase the intensity of the long product after amplification. This practice did not change the final calculation; rather, it improved the ratio estimation, especially for long products below detectable level by computer-assisted software (data not shown). 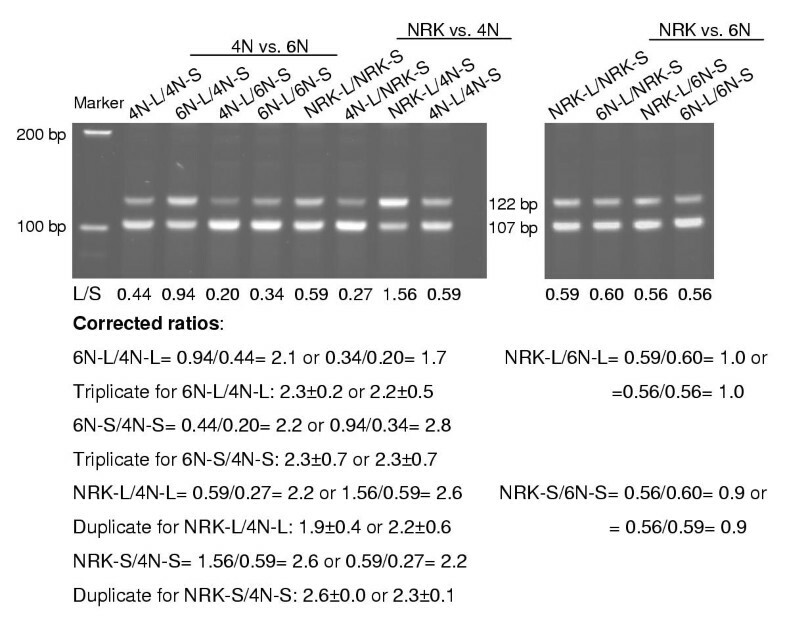 The observed and corrected ratios for cell lines 4N versus 6N, NRK versus 4N, and NRK versus 6N are illustrated in Figure 7. For each pair, four observed ratios of long to short products, including two for baseline correction and two of crude ratio between cell lines, were used to cross-check the accuracy of final quantification. In repeated experiments, the ratios of 6N over 4N (6N-L/4N-L or 6N-S/4N-S) and NRK over 4N (NRK-L/4N-L or NRK-S/4N-S) using either of the corresponding baseline estimators (4N-L/4N-S or 6N-L/6N-S; NRK-L/NRK-S or 4N-L/4N-S) were statistically not different within the group (p = 0.85 and p = 0.40, respectively). This similar two-fold up-regulation of the Collagen I in 6N and NRK over 4N was further confirmed by a direct comparison between 6N and NRK, which showed an equal level of expression (right panel, Fig. 7). The Collagen I ratios of 6N over 4N and NRK over 4N from microarray analysis were equal or higher than 1.7, the lower end of ratio differences regarded as likely significant by IncyteGenomics. Thus, this new RT-PCR technique is very reliable for confirming microarray results. Application of the new quantitative RT-PCR to determine the ratios of gene expression among cell lines. The Collagen I cDNAs were synthesized by Omniscript reverse transcriptase. The observed 35-cycle values of long (L) over short (S) PCR products from different sample combinations were used for calculation of corrected ratios. 4N: wild-type VHL-transfected NRK; 6N: mutant VHL-transfected NRK. To achieve accuracy of quantification for RNA transcripts requires the acquisition of reaction and detection linearity throughout the entire procedure. Since the first development of RT-PCR, numerous approaches have been formulated to improve the precision of protocols from RNA measurement, RT, PCR, signal detection and analysis, to final mathematical correction. In this study, we have explored many aspects of quantitative RT-PCR with emphases on the RT and PCR steps. Accuracy is enhanced by improving the linearity of the RT reactions and by eliminating variations among PCR reactions (exemplified in Figs. 4B and 5B for efficiency), as well as sample loading for gel electrophoresis since two samples were co-examined during these analyses. Although competitive RT-PCR also provides such advantages, quantification with the latter technique is complicated by the need of reliable controls and for accurate estimation. Also, these controls are usually purified RNA or DNA, which are much more abundant than the target sequences in the cell sample. Serial dilution of controls is required for competitive RT-PCR. The unique designs in the new technique, such as gene-specific RT primers, a linker of either 10 or 15 bases in the long RT primer, and co-purification of cDNAs generated from the short and long RT primers, are different from the Ambion IntraSpec kit and are apparently important innovations to obtain specific amplification and accurate quantification. The strengths of this new quantitative RT-PCR include: it is a direct comparison of two RNA samples with no need of synthetic control(s); it is simple with no complex issues arising from the use of synthetic control(s); and it is accurate. Although a slight variation of ratio estimation utilizing 1:1 volume ratio of long to short product from the same RNA for baseline correction is seen, this can be highly reduced by the use of 5:1 (Figs. 4 and 5) or 2:1 (Fig. 7) for correction. Up to 1 order of magnitude of the dynamic range has been accurately obtained using the new method. Further analyses for higher ratio differences are needed to establish the upper limit of dynamic range for this method. The accuracy of this direct quantitative RT-PCR is also demonstrated in the comparison of the Collagen I expression among three cell lines (Fig. 7). Inclusion of 4 reactions for each pair is useful for cross validation of the corrected ratio. In general, two reactions, one for baseline correction and one of crude ratio between samples, are sufficient to determine the final ratio. Although the new technique measures only relative amounts of RNA in the two samples, an absolute copy number can be calculated from a calibration curve of reference DNA with the same sequence and length loaded onto the same gel. Reference DNA can be generated by PCR and purified in large quantity, and the copy number is then estimated from the absorbance at 260 nm wavelength. The new technique can also be modified to use regular polyT as a RT primer to produce cDNAs for subsequent PCR of more than one gene. We have synthesized chimeric primers to generate first-strand short and long DNA from corresponding polyT-cDNAs. The two first-strand DNAs are combined and are analyzed as in the present protocol. Although the current version of this new methodology is not suitable for high throughput gene expression profiling, we are currently investigating the possibility of converting this direct quantitative RT-PCR into a real-time format. With this innovation, no multiple PCR with incremental cycles is needed to determine the minimal number of cycles. Signal acquisition, graphic plotting, and baseline correction can be streamlined by any real-time analyzer with sophisticated software. A direct quantitative RT-PCR (Fig. 2) has been described to obtain accurately the ratio of gene expression among samples. Approaches to reduce analytical variation throughout the entire RT-PCR procedure have been also presented here in detail. Trizol reagent was used to extract total RNA from a NRK-52E rat kidney cell line and its daughter lines , according to the manufacturer's direction with some modifications (Life Technologies, Gaithersburg, MD). In brief, cells were cultured in Dulbecco's modified Eagle's medium (Biofluids, Rockville, MD) supplemented with 4 mM L-glutamine, 5% calf serum, 100 unit/ml penicillin, and 100 μg/ml streptomycin, in 3 T-162 flasks until they reached confluence. After removal of the media, 15 ml Trizol reagent was added directly into the first flask and then transferred sequentially to the second and the third flasks. The 15 ml lysate was held for 15 minutes at room temperature before the addition of 3 ml chloroform and vigorous shaking for 15 seconds. Phase separation of organic and aqueous layers was accelerated by centrifugation at >12,500 × g for 15 minutes at 4°C. The upper aqueous phase was transferred into a new tube and 8 ml isopropanol was added, followed by centrifugation at 14,000 × g for 15 minutes to precipitate RNA. The pellet was dissolved in RNase-free water. The total RNA was quantified by a spectrophotometer (8452A, Hewlett Packard, Mississauga, Canada) at 260 nm and was then verified with a RiboGreen RNA quantitation kit following the manufacturer's instruction (Molecular Probes, Eugene, OR). The RiboGreen fluorescence binds efficiently to single-stranded nucleic acids without interference from proteins and remnants of RNA extraction reagents, if present, in RNA solution. Ribosomal RNA was provided in the kit for generation of a standard curve, which was then used for sample quantity estimation. The direct quantitative RT-PCR method is outlined schematically in Figure 2. An Avian Myeoblastomosis virus (AMV) reverse transcriptase without RNase H activity (Thermoscript, Invitrogen, Carlsbad, CA), Moloney Murine Leukemia virus (MMLV) reverse transcriptase without RNase H activity (Superscript II, Invitrogen; Retroscript, Ambion, Austin, TX), or a new reverse transcriptase retaining the RNase H activity (Omniscript, Qiagen Inc., Valencia, CA) was used to generate cDNA strands following each supplier's protocol. Briefly, RT was carried out in a 20 μl mixture including 0.5 μM gene-specific chimeric primer and 200 ng to 2 μg total RNA. The RT chimeric primer consists of a gene-specific and a universal sequence with or without 10- or 15-base linkers (Table 1). Oligo software (version 5, National Biosciences, Inc., Plymouth, MN) was utilized to assist the primer selection . The universal sequence was manually composed and did not match any sequences in the GenBank. This sequence was specifically recognized by the lower PCR primer during amplification. The reaction was performed at 55 to 65°C (for Thermoscript), 42°C (for Superscript II and Retroscript), or 37°C (for Omniscript) for 1 hour and was stopped by heat inactivation of the enzyme, as described by the manufacturers. Chimeric primers for RT and primers for PCR. Gene-specific sequences: letters in italic; a universal sequence: bold letters; the linkers (N)n: either (A)10, (C)10, (G)10, (AT)5, or (A)5(G)5(A)5. An aliquots of the short and long cDNAs were combined directly for purification with a Microcon 50 size-fraction spin column (Millipore, Bedford, MA) to remove RT primers before PCR. A Platinum Taq polymerase kit for hot start PCR was used according to the manufacturer's instruction (Invitrogen). Briefly, PCR was carried out in a mixture of 20 mM Tris-HCl, pH 8.0, 50 mM KCl, 0.2 mM deoxynucleotides, 1.5 mM MgCl2, 0.2 μM of each primer, and 2 U Platinum Taq DNA polymerase. The PCR thermal control started at 94°C for 2 minutes initially to activate HotStart Platinum polymerase, followed by cycling of 94°C for 30 sec., 60°C for 30 sec., and 68 (or 72) °C for 1 minute for 25 to 40 times. The amplified short and long products with 10 and 15 base-pair (bp) difference in length were resolved in 20% and 10% polyacrylamide gel (Invitrogen), respectively. The gel was then stained with SYBR Green I fluorescence (Molecular Probes). Fluorescence signal was detected and analyzed by a BioChemi imaging system equipped with LabWorks 4.0 software (UVP Inc., Upland, CA). Initial measurement using "area density" function, which requires manually bracketing product bands, did not give a consistent quantification from the same products. A function with computer-assisted band identification and integration of peak area capabilities was finally utilized to obtain fluorescence intensity and the ratio between short and long product from the same reaction. Log scale of fluorescence intensity was plotted against PCR cycle number to determine the amplification efficiency. Quantification using a commercial comparative RT-PCR kit, IntraSpec, was performed according to the manufacturer's instruction (Ambion). The RT primers, Tag10 and Tag50, with 40-bp difference in length were provided and were designed to recognize the polyA tail of mRNA. RT reaction was carried out at 49°C for 2 hours. 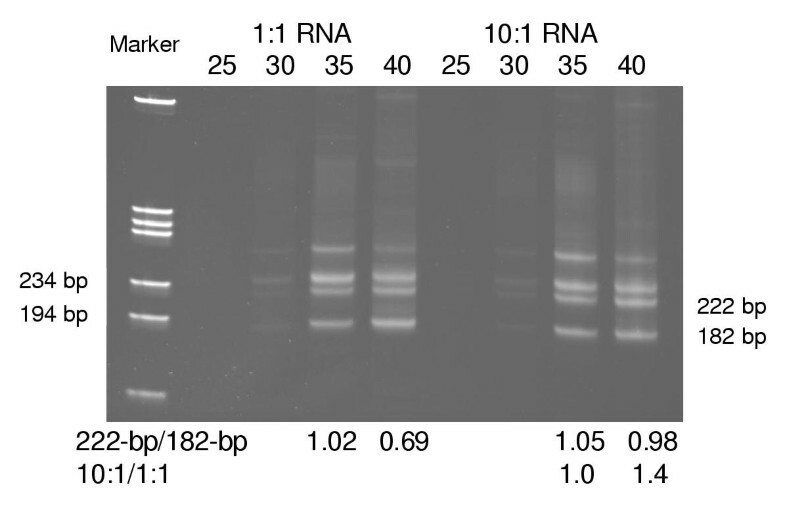 After purification of the Tag10 and Tag50 cDNAs by a DNA-binding spin column, the two cDNAs were combined in a single PCR using the lower primer provided in the kit and an upper primer, which was selected following the manufacturer's guidelines. The PCR was conducted as described above except the annealing temperature was reduced to 50°C. The ratios of repeated experiments were expressed as mean ± standard deviation. The consistency of mean ratios among experiments with different permutations, such as PCR cycles and the choice of baseline correction, were tested by ANOVA using the StatView software (Version 4.5, Abacus Concepts, Berkeley, CA). Mean ratios were considered to be not different if the p value was higher than 0.05. I would like to thank Dr. Lucy M. Anderson for her crucial comments and support, Dr. Ailian Zhao and Ms. Noureen Khan for discussion, and Dr. Robert Cheng for critical review of this manuscript. YHS developed the idea, designed and carried out all experiments, and prepared the manuscript.